Cha siu bao or Chāshāobāo is a Cantonese barbecue-pork-filled bun (baozi). The buns are filled with barbecue-flavored cha siu pork. They are served as a type of dim sum during yum cha and are sometimes sold in Chinese bakeries. There are two major kinds of cha siu bao: steamed (蒸, zhēng) and baked (烤, kǎo). Steamed cha siu bao has a white exterior, while its baked counterpart is browned and glazed. Cha siu refers to the pork filling; the word bao simply means "bun". 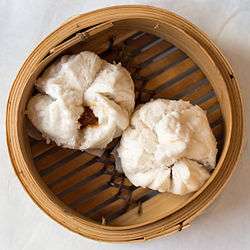 Although visually similar to other types of steamed baozi, the dough of steamed cha siu bao is unique since it makes use of both yeast and baking powder as leavening. This unique mix of leavening gives the dough of cha siu bao the texture of a slightly dense, but fine soft bread. Encased in the center of the bun is tender, sweet, slow-roasted pork tenderloin. This cha siu is diced, and then mixed into a syrupy mixture of oyster sauce, hoisin sauce, roasted sesame seed oil, rice vinegar, shaoxing wine or dry sherry, soy sauce, sugar and cornstarch. In Hawaii, the item is called Manapua. Its name is a shortening of the Hawaiian mea ʻono puaʻa, meaning, "delicious pork thing." 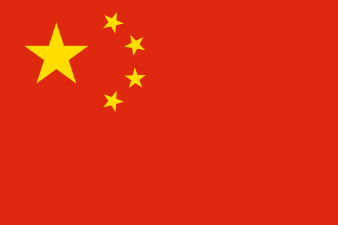 In the U.S. mainland, the Chinese term is commonly used. The Chinese brought this dim sum item with them when they were brought over as plantation workers. In American Samoa and its surrounding islands, the item is referred to as keke pua'a, literally meaning "pig cake". This food usually consists of a white bun with a dark pink-colored diced pork filling. The Hawaiian version of the cha siu bao tends to be larger than its Chinese cousin and can be either steamed or baked. The red pork filling's dark pink color comes from marinating the pork with a very small amount of saltpeter prior to slow roasting. The bun is occasionally baked, but more frequently steamed when it is made. Manapua has come to mean any meat-filled or bean-paste-filled bun made with the same dough as described above including locally created versions with hot dogs, curry chicken, kalua pig, and even ube (purple yam), which is a popular vegetarian version of the manapua. In Hawaii, freshly prepared or prepackaged frozen manapua may be found in dedicated bakeries, restaurants, and chain convenience stores. Wikimedia Commons has media related to Cha siu bao. 1 2 3 Hsiung, Deh-Ta. Simonds, Nina. Lowe, Jason. . The food of China: a journey for food lovers. Bay Books. ISBN 978-0-681-02584-4. p24. ↑ Christopher DeWolf; Izzy Ozawa; Tiffany Lam; Virginia Lau; Zoe Li (13 July 2010). "40 Hong Kong foods we can't live without". CNN Go. Retrieved 14 August 2012. ↑ Geni Raitisoja (June 25, 2008). "Chinese recipes: char siu (barbecued pork)". All About China. Radio86. Archived from the original on 2012-03-27.